Central banks like gold because, in the words of former Federal Reserve Chairman Greenspan: “Gold has always been accepted without reference to any other guarantee” (for a summary of stunning quotes by Greenspan on gold in the current environment, please read “ Greenspan: Price of Gold Will Rise"). Talking about over-allocation: what about that equity allocation? For most investors, the equity allocation of their portfolio has done very well. In recent years, we believe volatility in the equity markets has been suppressed by central bank policy. Are you able to stomach a downturn should volatility surge? And if not, where do you hide? It’s that last part for which there’s no easy answer because central banks have created an environment where there may not be such a thing as a safe asset anymore. What investors can do is have a toolbox available to counter the toolbox of central banks. 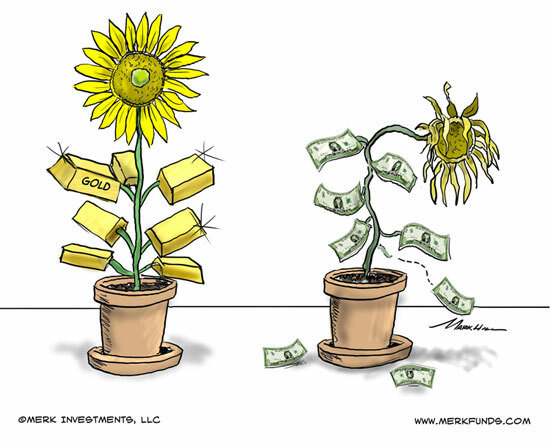 We think investors may want to consider having gold in that toolbox. How much? If you would like to learn more about the role gold may play in such a portfolio, please register to join us for our February gold webinar. If you believe this analysis might be of value to your friends, please share it with them. Also, if you haven’t done so, please sign up to receive Merk Insights for free. This report was prepared by Merk Investments LLC , and reflects the current opinion of the authors. It is based upon sources and data believed to be accurate and reliable. Merk Investments LLC makes no representation regarding the advisability of investing in the products herein. Opinions and forward-looking statements expressed are subject to change without notice. This information does not constitute investment advice and is not intended as an endorsement of any specific investment. The information contained herein is general in nature and is provided solely for educational and informational purposes. The information provided does not constitute legal, financial or tax advice. You should obtain advice specific to your circumstances from your own legal, financial and tax advisors. As with any investment, past performance is no guarantee of future performance. ©2005-2015 Merk Investments LLC. All Rights Reserved.